The PSC VIC offers two beautiful art exhibition spaces with rotating shows. Exhibits are available for viewing in the VIC building during open business hours. Admission is free. 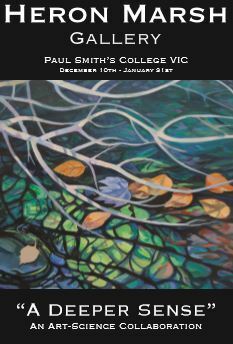 Artists interested in having a show in our galleries should e-mail us at vic@paulsmiths.edu . On their own schedules, with choice of medium and location throughout the VIC and other Paul Smith’s College property, ten artists created for all, or parts, of seven days from Sept. 1-7 in the great outdoors. Framed originals were due by 10 a.m. on Saturday morning the 8th, and installation in the Great Room quickly followed. 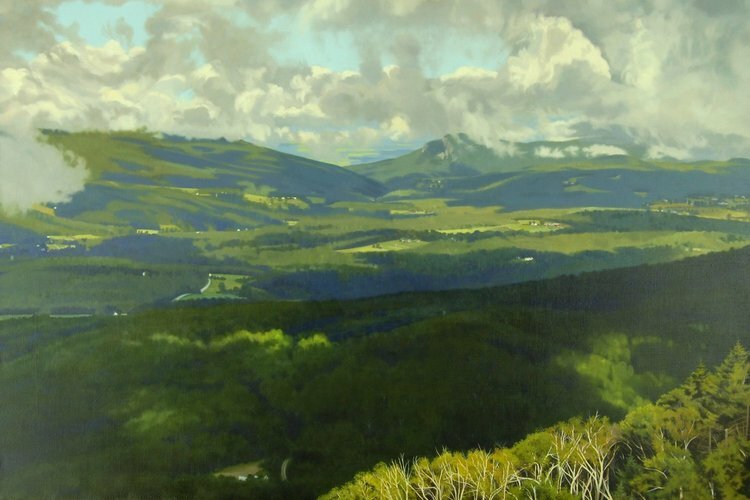 Be sure to stop by the VIC and see another stunning collection of plein air art. 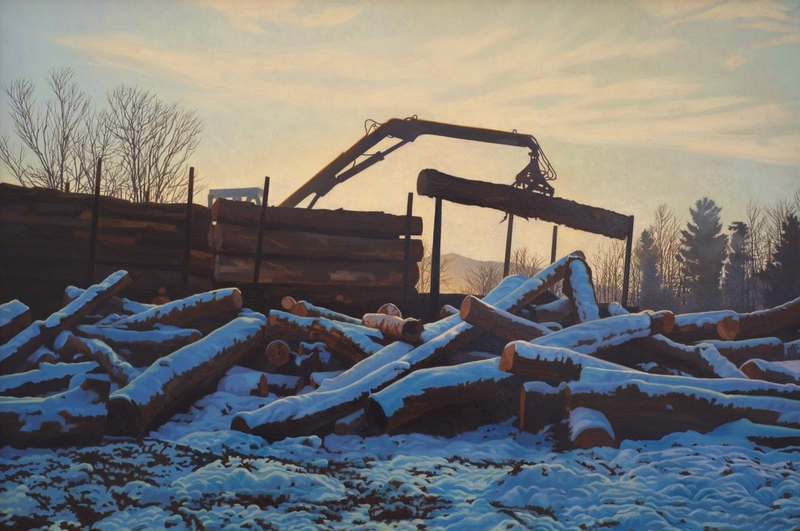 Curated by the Adirondack Center for Loon Conservation, this exhibit includes photography, carvings and other artwork from award winning artists across New York. In a wide variety of styles and mediums, the artists, photographers and carver masterfully depict Common Loon behaviors. Artists were encouraged to interpret this year’s theme, renewal, in any artistic medium. They were also asked to prepare a brief statement about the idea or inspiration presented. The result is a diverse show of over 30 pieces. Some of the artists will be present during SAMFest—join us and help celebrate 5 years of SAM Fest. Well researched and detailed, Lisa McLaughlin’s lifelike paintings highlight the unique features of each avian species. The Paul Smith’s College VIC is proud to announce Decomposition, featuring digitally-submitted pieces embodying the rich process of decomposition as a bridge between death and renewal. This exhibit will be featured in the VIC’s Heron Marsh Gallery. The gallery offers 100 linear feet of exhibition space, featuring natural stone walls, vaulted ceiling and ample natural light through UV-coated windows, all housed within a popular nature center in the world-renowned Adirondack Park located in upstate New York. 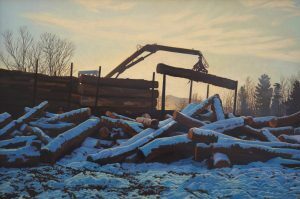 Cory E. Card is the Curator and Director of Visual Arts at View arts center in Old Forge, New York. 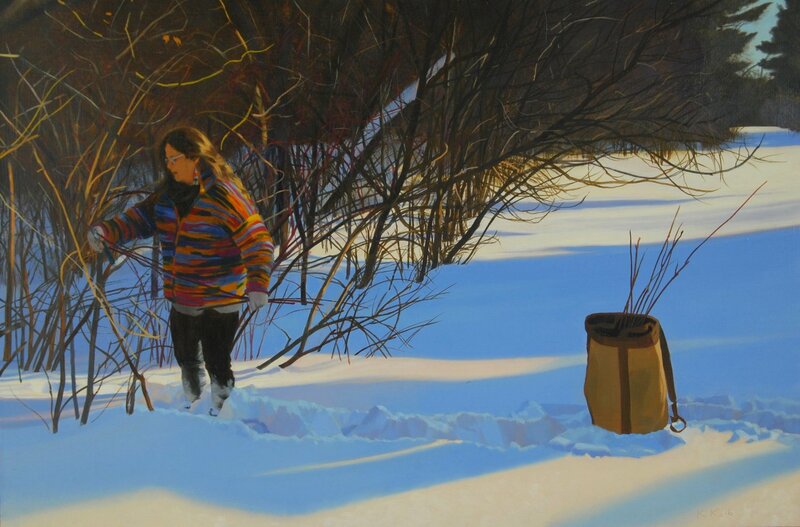 He holds an MFA in Fine Arts from Rochester Institute of Technology. He previously held positions in the Exhibitions Department at the George Eastman House Museum, and has taught courses in critical theory, professional practices, drawing, two dimensional design and studio survey at Rochester Institute of Technology, SUNY College at Brockport and Monroe Community College in Rochester. On top of his curatorial and programming duties, he is a practicing visual artist, whose current body of work, Sweepings, is an investigation into the microcosm of dust and debris. Submissions are no longer accepted. Please download this PDF to learn more. The Paul Smith’s College VIC is a real gem in the Adirondacks. Miles of easily accessible trails wind through old growth forest, along Barnum Brook, Black Pond and Heron Marsh, up to the summit of Jenkins Mountain, through bogs, fens, and past beaver ponds. 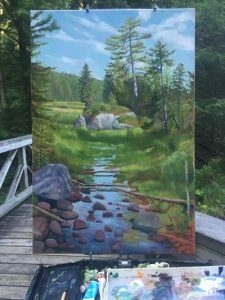 There are 100’s of great painting locations and the VIC hosts painting days during the Adirondack Plein Air Festival in August and the Publisher’s Invitational “Adirondack Paint Week” in June every year. 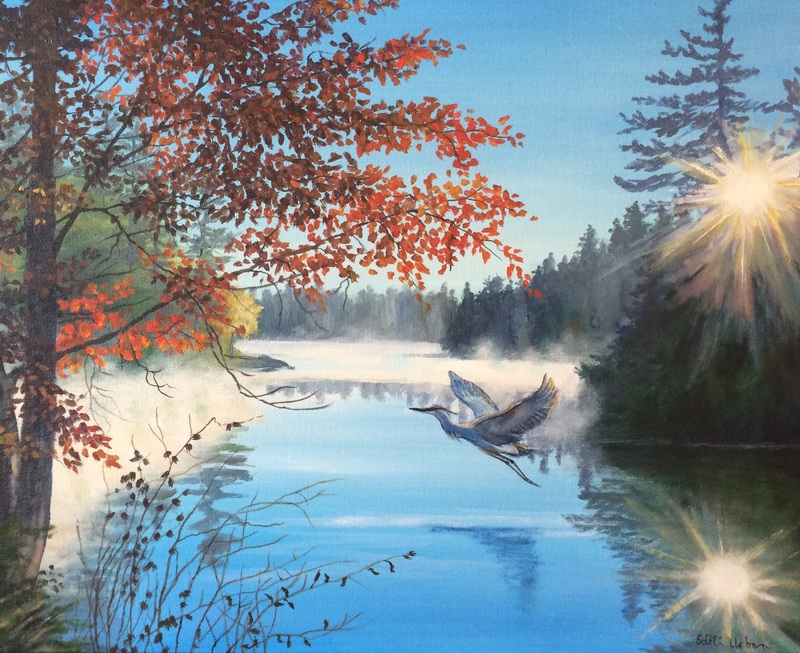 This event will invite artists to paint throughout the VIC and Paul Smith’s College property, as well as neighboring Barnum, Mountain, Osgood, and Jones Ponds, Lower St Regis Lake, White Pine Camp and other scenic places nearby. Artists can paint there beginning Friday Sept 1 (Labor Day weekend) and through Thursday Sept 7. 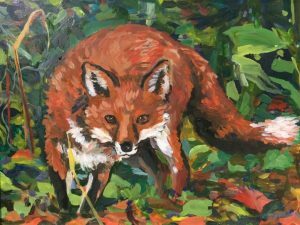 Come paint for a day, a couple of days, or the entire week. Framed paintings will be due Friday Sept 8, with a reception from 3 – 5 pm. Works will remain on exhibit in both galleries at the VIC until September 20, during our beautiful peak fall colors. There will be a 30% commission on sales and artists will be responsible for coming to pick up their work at the close of the exhibit. View our full list of selected works and award winners here. The Paul Smith’s College VIC is proud to show this year’s bird-focused art installation. Birds! 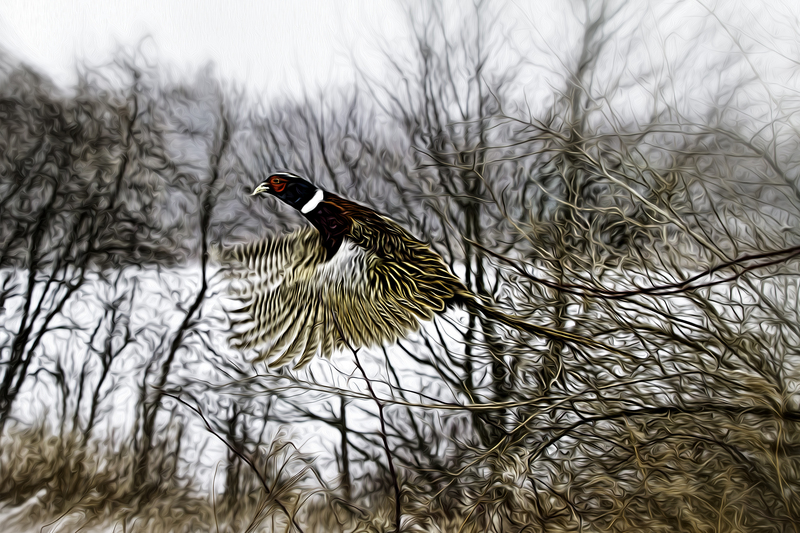 is an exhibit highlighting the beauty of our favorite Adirondack feathered friends. 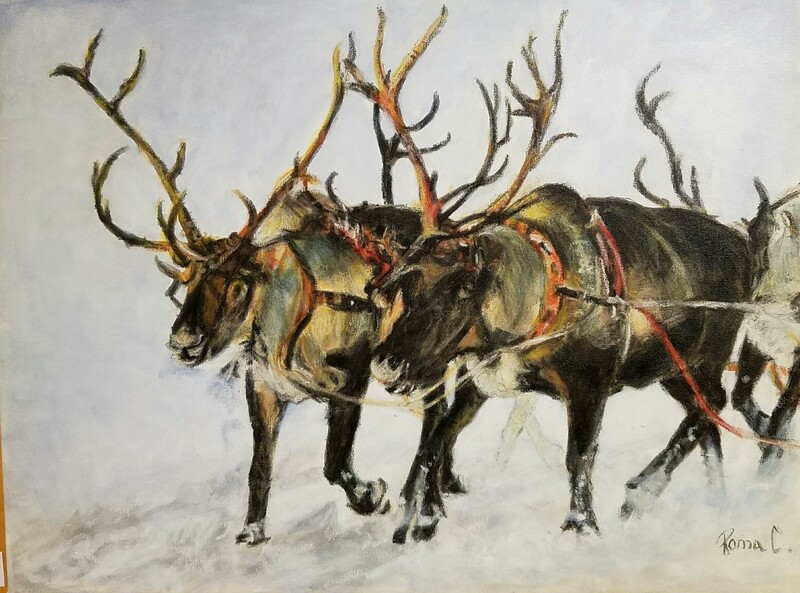 Joy, smiles and awe are guaranteed thank to the works of the 23 talented local artists who are featured in this art show. 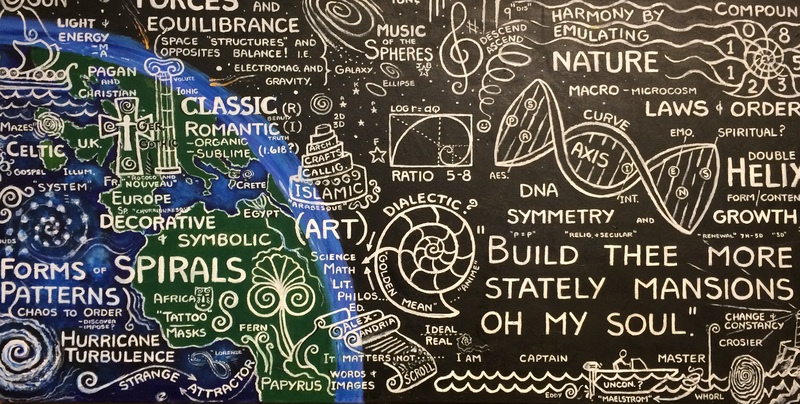 This year’s Science, Art and Music Festival (SAMFest) marked the start of our current Great Room Art Exhibition, Connections. In keeping with the theme of SAMFest, this exhibition features over 20 artists whose works interpret our connection to the land, connection of people with each other and the natural world, our connection to our past, and more. With photographs, watercolors, prints, and many other media, this beautiful installation highlights some of the Adirondack region’s best artists. Each piece provides a unique statement so that viewers can gain insight into the artist’s individual understanding of connections and their artistic process. Each year the Paul Smith’s College VIC invites local photographers to participate in a photo shoot-out. This year, artists were asked to take photographs at the VIC on Earth Day, April 22, 2017. Each artist then submits up to five photographs from that day’s photo shoot, which are then installed in the Heron Marsh Gallery at the VIC. We live in the forest, that huge biome named the Northern Forest, to be exact. In addition to all the products it gives us, the forest is our home. 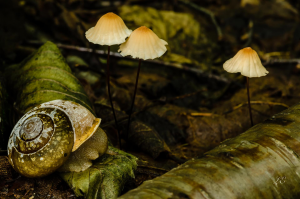 Perhaps that is the reason we often feel restored by simply walking in the woods. A Deeper Sense featured work of local artists and include diverse media including watercolor, oil, fabric, mixed media, photography, video, and poetry. The installation was a collaboration between Paul Smith’s College students and local artists. 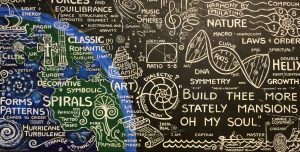 During the fall 2016 semester, area artists and poets were invited to shadow young scientists in their ecological field studies, to learn about ecology, and to produce pieces aimed at capturing a feeling of connection with the land. 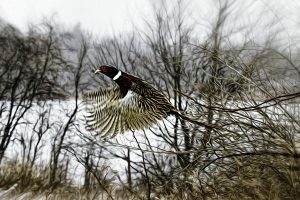 These studies featured three projects: development of a land management plan for the Adirondack Mountain Reserve (Ausable Club); long-term monitoring of the Smitty Creek Watershed, located near St. Regis Mountain; and a study of factors that influence the distribution of black spruce and tamarack in the Adirondacks. Head to the VIC and discover our local artist’s interpretation of this installation’s “winter” theme.